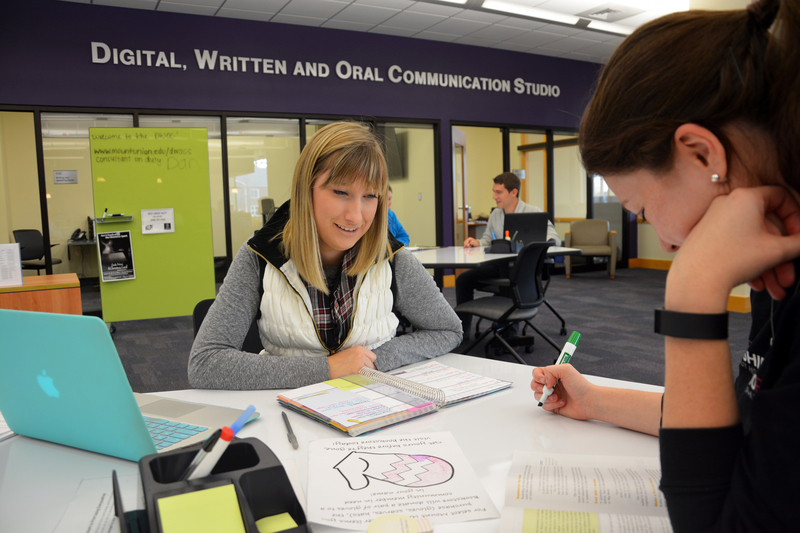 The DWOC Studio is located in the library and is open to all students at the University of Mount Union. The Studio provides a space to work on writing, oral presentations, and multimedia projects. Consultants are on hand to provide help with critical thinking at the beginning stages of a project and to support you throughout the writing, speaking, and production process, including with polishing a final draft. We can help with essays, employment and graduate school documents, public speeches, PowerPoints, Prezis, videos, audio files, ePortfolios, and the WOC Portfolio required of all second year students as part of the Integrative Core. Need to work on a writing project, presentation, or digital assignment? Schedule an appointment with an undergraduate consultant today! Are you a graduate student with more advanced concerns? Learn how to schedule your consultation below. Find out when your favorite DWOC Consultant is scheduled to work! I am a PhD student currently working on my dissertation at Kent State University. My field of research and teaching is writing studies, and I focus on writing centers and how they can best help graduate student writers. I have been working as a writing consultant since 2007, when I served as a peer tutor during my undergraduate studies. Since then, I have worked as a graduate writing consultant, a professional writing consultant, and as an assistant director of a large writing center. I very much enjoy helping students at every level develop a sense of themselves as writers, and I look forward to helping them continuously grow throughout all levels of the writing process – from brainstorming to final polishing. My interest in writing developed alongside my obsession with reading. Some of my favorite books are 11/22/63 series because I thoroughly enjoy historical fiction. I took AP writing-heavy courses in high school and have further developed my writer’s voice here at Mount Union. I love the feeling of looking at a finished product and actually being proud of what I’ve produced. Outside of these two aspects of my life, I like to watch scary/horror movies and look at pictures of elephants. I started my freshman year as a nursing major so if you have any questions regarding anything on that subject I can guide you in the right direction as best I can. Feel free to stop by and see me! The process of learning my own writing style has spanned from the time I could first use my imagination. The stages were each filled with different muses and motivation, however, my desire to write and create was always present. Since coming to Mount Union, I have learned more than I thought possible about my writing style, and how to precisely relay my thoughts to the page. I enjoy organizing papers, moving through the creative process, and creating oral presentations. My time in theater helped me find a voice and a desire to express my thoughts through performance. I look forward to helping with anything I can, and I will do my absolute best in aiding you through your own process! In first grade I taught myself how to use the family computer so I could use Microsoft Word for my writing. I loved tapping away at the keys one by one, watching my stories as they appeared on the page. My writing eventually progressed from very short stories about spaceships and aliens to more mature pieces, like novels about spaceships and aliens. Creative writing is in my blood; it’s what I do, but whether it’s a short fiction piece or a research essay, I’d love to lend a hand. I get that college papers can be a little unnerving at times, and I hope I can help ease the stress a little. Aside from working at the DWOC, I’m an RA, a trombonist, a bassist, and the secretary for the Calliope. I also have a cute dog. I’ve always enjoyed writing and reading in many different genres, especially poetry, short stories, and novels. Although creative writing is my main interest, I also enjoy professional writing. I would love to help you with any stage of the writing process! It took me a long time to gain confidence in my writing and speaking abilities, and through the DWOC, I hope to help you find confidence in your abilities as well! In addition to working at the DWOC, I am a member of Calliope, English Society, and the Mount Union choral program. I can often be found in the library, or playing my guitar and writing songs in the music building. I love writing and would be happy to assist you with any stage of the writing process! Brainstorming, researching, and editing are just a few of the many aspects I would enjoy helping you with. If you ever feel like your paper is lackluster, unorganized, or has wandered off topic, I encourage you to make an appoint with me at the DWOC Studio. Giving presentations can also be scary. I would love to offer you honest feedback and guidance as you complete your presentations for the Integrative Core or in your major. Between my involvement in The Dynamo, in APO, and at the radio station, I understand how difficult it can be for a busy student to maintain a good GPA. So whether you want to redo an entire presentation, or just want someone look over your paper’s paragraph structure, don’t hesitate to stop by and see me! Ever since I can remember, reading has been one of my favorite things to do. I hadn’t realized I liked writing as well until I took a literature class during my first semester at Mount Union, and enjoyed the course, rather than dreading it. Even more than writing my own work, I like helping others with their pieces. I love when my friends come to me to go over their papers with them, so I’m excited to get to do more of that while working in the DWOC! I can help with anything from research papers and lab reports to short stories and essays, as well as presentations. Aside from working here, I can usually be found around campus at Fraternity and Sorority Life events, anything Student Senate related, or giving tours at the Welcome Center! I love getting to know both incoming and current students, so feel free to stop in and see me during a shift! My interest in writing dates all the way back to middle school, when I signed up for my school’s competitive writing team. Back then, I had a passion for fiction writing. Now, however, the majority of my writing is scientific. My neuroscience and chemistry courses have led me to become very familiar with scientific writing techniques and citation formats such as APA and ACS. My minor in gender studies keeps me familiar with the humanities as well, so I am still very familiar with formats such as MLA. In any style of writing, I love the process of taking my time to do thorough background research using the databases available from the library, and then using that information to create an outline in order to make the overall paper-writing process seem less daunting. I look forward to working here at the DWOC, so feel free to make an appointment with me! I am also active on campus as the Vice President of GSA/PRIDE. Despite the fact that I am a number-minded math major, I have a passion for reading. I admire the impact that well strung together words can have. I know the pride that I feel when I finally piece together my ideas into an eloquent work of writing and want to help others reach this same end goal! Even though I am a quieter person, I enjoy putting together and preparing presentations to share my knowledge with others. I am looking forward to helping you comfortably deliver successful speeches too! On campus I am a member of the Women’s Lacrosse Team, the Vice President of the Honors Council, a musician in our string orchestra program and I tutor middle schoolers in math. I am so excited to get working with you! Hello, everyone! My name is Cassie, and I'm a junior double major in Theatre Performance and Sociology. I have always enjoyed using my words to make a difference. In high school, I spent the majority of my time on the speech team. Now I use my public speaking experience to make my oral presentations as strong as possible! I hope to someday teach at the university level, so I am excited to help you work through your writing and speaking assignments. Stop in and let's make that paper or presentation as great as it can be! Even though it may not seem apparent based on my majors, writing is one of my favorite forms of self-expression, and I consider it a very important part of who I am. I started writing for fun in middle school, and I've been hooked ever since. I am happy to help with any kind of writing, but I feel especially qualified to help out with research papers and lab reports. I’m a stickler for organization and clarity-of-thought in writing, which I find also applies well to presentation prep. In my free time I participate in Mount Union’s Concert Choir, GSA Pride, Theater, and Good Vibes Only. I’m excited to assist you with your writing and to hopefully help you see it as a wonderful (maybe even fun) tool, instead of a drag. My love for reading and writing can be traced back to elementary school writing prompts. I have always loved that someone you have never met could make you feel informed, inspired, or a range of emotions, using only words. Because of this, I became the friend that everyone went to for help with papers and presentations. I want to continue my passion for helping people bring their visions to life by assisting you in any stage of the communication process! I know how intimidating some assignments and presentations can seem, so I can share helpful strategies and organization tips to make the process as painless as possible. You can count on my honest feedback, patience, and reassurance through any assignment. Whether you are completely blocked on a first draft--don’t worry, we’ve all been there--or you are struggling with revision, feel free to make an appointment with me so we can work through it together! One of the reasons I wanted to study English was because of the creative freedom it provides me. Communication, writing, and reading are essential to all people, and I find it fascinating how these tools can be used in so many different ways, from basic day-to-day dialogue to artistic expression. My hope is that through the DWOC Studio, clients will appreciate how useful these skills can be, especially outside of just papers and presentations. Aside from working at the DWOC Studio, I am also an Integrative Core student worker and am involved in Calliope and English Society. I’m a senior Theatre and Communication double major with a passion for words, both written and spoken. You’ll see me running around campus with Honors Program, Theatre, and Black Student Union. The majority of my experience is in giving speeches and writing essays. I’m particularly partial to the nitty gritty of the revision process, but am more than willing to brainstorm with you! I’m excited to start working through projects with you. And no worries, we’ll figure it all out together! Sunday: 6 - 10 p.m.